August 5, 2017 Jeff 2 comments. 2.4 mile swim, 112 mile bike, 26.2 mile run. While doing a race like this would sound like a terrible idea to 99% of people, as a sports dietitian I work mainly with the 1% of people who not only think it’s a good idea but actually want to keep doing it over and over. 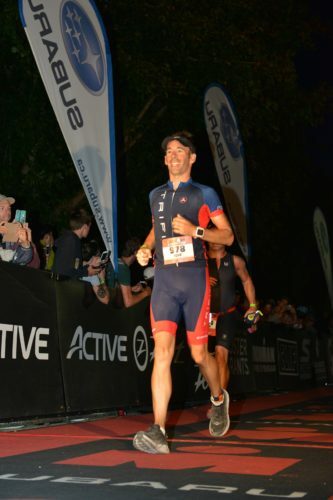 I have a background in endurance sports and have done shorter triathlons, but I knew there were some things that I could only find out from doing a 140.6 mile Ironman. 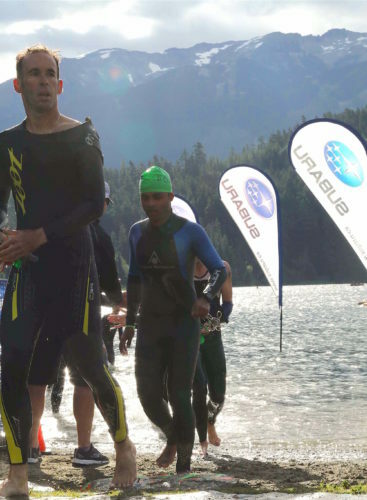 I knew there were some things that I could only find out from doing a 140.6 mile Ironman. 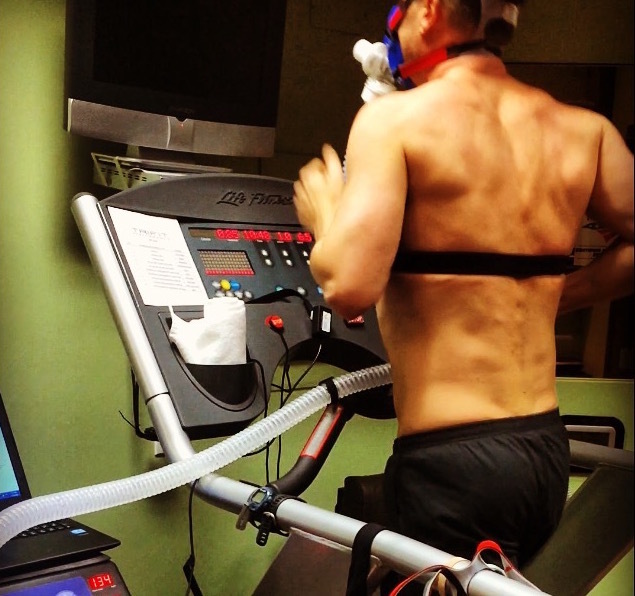 Over the past few years I’ve helped athletes complete over 50 full or half-Ironman races, and base my nutrition recommendations on the latest and best available sports nutrition research coupled with lessons learned from past clients along with my own experience as an endurance athlete. However, some of the things that come up after 9+ hours of racing are things that can’t get communicated in race reports or during office visits, and that you just won’t experience during shorter training sessions or races. I had to do one. So how was it? Well, if my day had ended after the bike I would have said that was the hardest workout I’ve ever done. Then let’s tack on a marathon. Carb loading is hard. I mean properly carb loading, not just eating some pasta the night before the race. Of course I’ve done some carb loading before bike races, triathlons, and tennis tournaments, but before Ironman I really wanted to do it by the book. 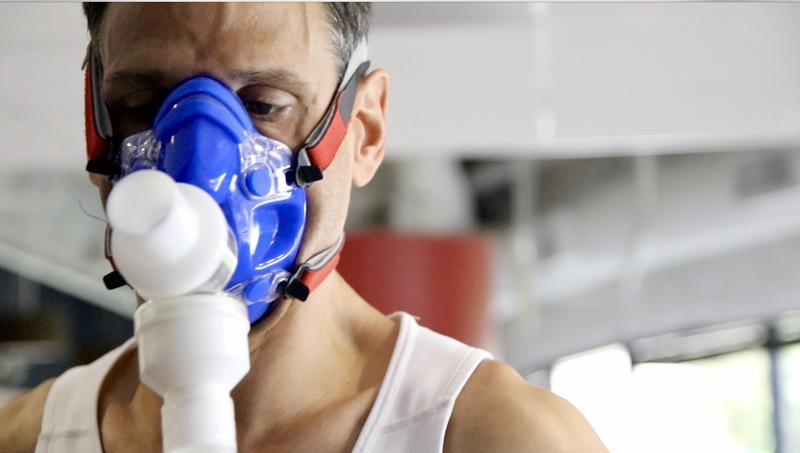 This means consuming anywhere between 7-10 grams of carbohydrates per kilogram of body weight for 2-3 days leading up to the race. That is a lot of carbs, especially if you’re not exercising on those days. To give you an idea of what this looks like, I made a calculator that you can use. I also gave you an idea of how many bananas or how much rice you’d have to eat to attain that number of carbs, but please don’t carb load solely with bananas or rice. Reducing fiber is fun. Finally an excuse not to eat my vegetables! 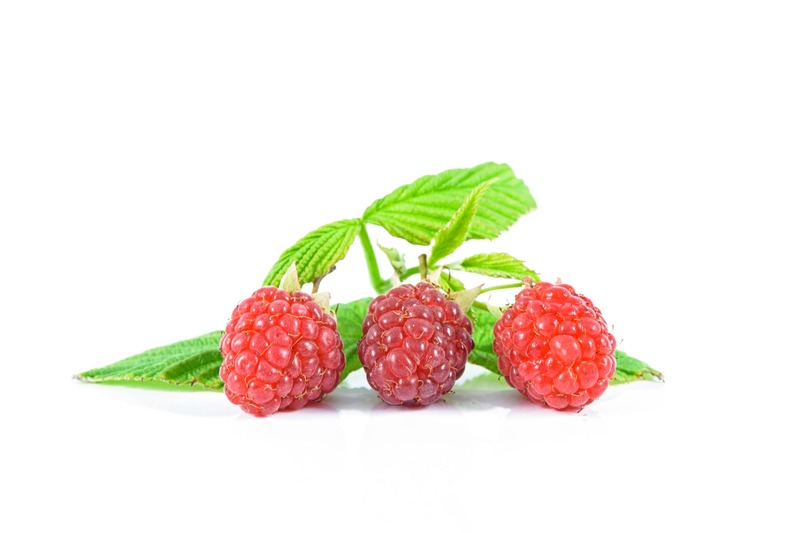 Many people don’t realize the importance of reducing fiber for 2-3 days heading into a long race. This is because fiber can hold water in your gut, and slow down the passage of nutrients. 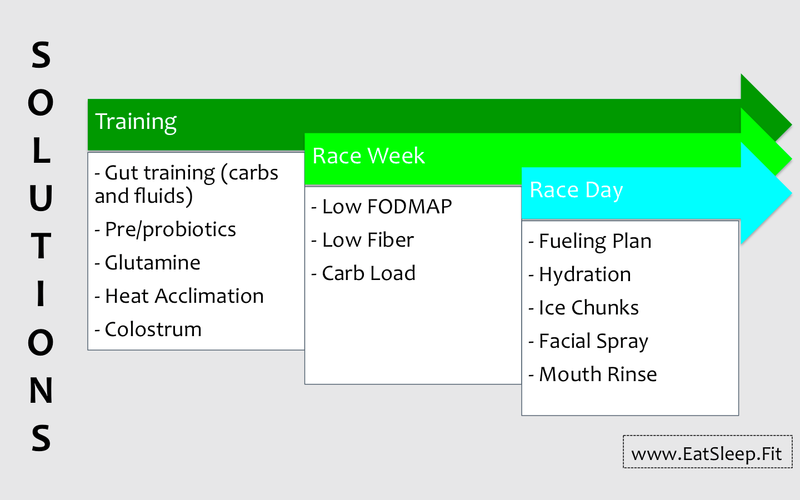 Reducing fiber for a few days can allow you to drop some (water) weight for race day and also reduce the potential for GI distress. We still want to continue intake of nitrate-rich veggies like celery, radish, and beets, but aim for white breads and minimize salads. Preparation is key. 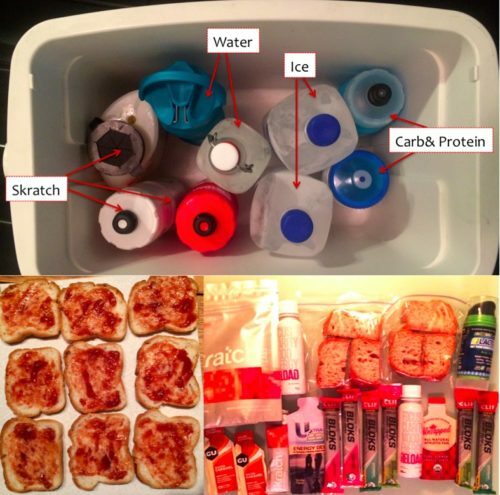 Sandwiches were made the night before long workouts and race day, and I would never leave the house for a brick workout without my cooler of cold water, sports drink, and recovery drinks. Bone broth on the course is amazing. We know there are many health benefits from consuming bone broth, including being good for the gut lining. It is also just about the perfect drink when you’ve been exercising for 9+ hours and your gut is unhappy. Progressive dehydration. 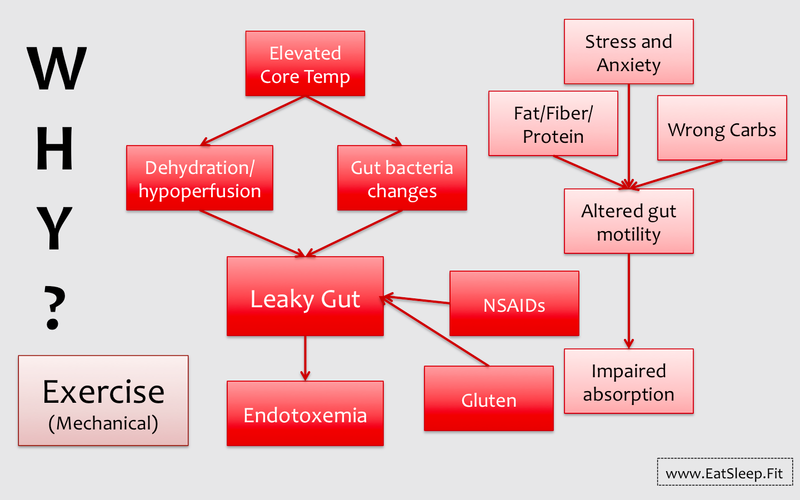 The reason your gut is unhappy at that point is in part due to the dehydration that occurs during exercise. We have a fluid absorption limit of about 1-1.5 liters per hour, while we can have sweat rates of 1-3 liters per hour. You don’t need to be a genius to deduce what will happen as you exercise for an entire day! This further emphasizes the reasons to start off hydrated, and drink appropriate amounts (and types) of fluids during the day. Be wary of NSAIDs. This was not a direct lesson learned by me but something that one of my clients had to deal with. He’d been taking Advil very regularly for several months prior to the race. Advil and other NSAIDs are known to cause increases in intestinal permeability, something that also happens with extended exercise. This means you’ll be much more likely to have GI issues during your race, which will mean you will probably fall behind on your fueling, and be much more likely to bonk on the run. Gatorade recently reformulated their ‘endurance’ product, likely based on emerging research which is a good thing. However, this is brand new and wasn’t available to test out before the race. Also, Gatorade Endurance is a 6% carbohydrate solution, which means it has about 60 g of carbohydrate per liter. In contrast Skratch is typically mixed around 4% solution which not only tastes better, but is likely better from a fluid absorption standpoint. I mixed the Gatorade on the course with water, but I still would have been happier if I’d brought some individual packs of Skratch to mix in my bottles on the course. Finally, I realized that it’s not just about nutrition and the most perfect fueling plan can’t make up for untrained legs! I had some ankle issues during training that required physical therapy and prevented me from really running for about seven weeks. I was eventually able to build up the milage but only up to about 13 miles. So I did the race not knowing how my legs would hold up through the marathon. By the middle of the run I had a tough time running, and it wasn’t because my heart rate was high, and it wasn’t because I’d bonked or even had low energy. This was mechanical stress, and my body just hurt when I tried to turn my legs over. I was able to get through it, and realized the importance of putting in the miles for all three disciplines. Overall, it was far and away the toughest thing I’ve ever done and I learned a whole lot throughout training and race day. With that being said, I know I will be back for more. Like what you’ve read? Sign up to receive insider info! Congratulations, Jeff! That is quite an accomplishment. I always learn something from you and think you do a great job of balancing the theoretical and the practical. BTW how did you get bone broth on course? Do you make your own? Thanks Jaycee! And luckily the race provided it, one of the sponsors was a Canadian bone broth company. I have made my own but not very often. I may be more inclined to do it now though.